On the micrograph above, the glycogen zone of two tubules can be seen. In this zone, only the innermost cellayers can show some small lipoid droplets. Cells in the intermediate layer do not accumulate fat but contain glycogen granules, stainable with acid phosphatase and with PAS techniques. On HE, these cells stain more darkly. 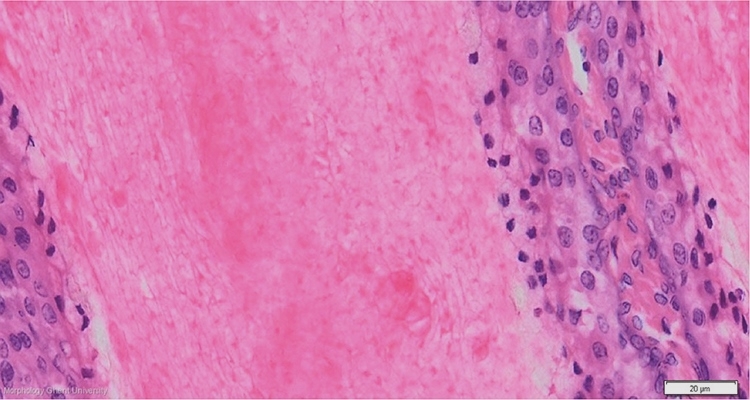 The amount of connective tissue in between the tubulus in the glycogen zone is more abundant than in the sebaceous zone.